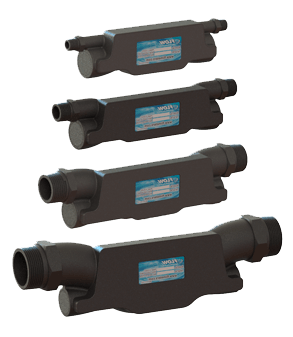 TEMPE, Ariz., February 27, 2017 – Flow Technology, Inc. (FTI), a leading manufacturer of precision flow measurement instruments, systems and calibrators, today introduced the QCT Series of liquid ultrasonic flow meters. Four meters are available ranging in size from 1/8″ to 1″. The QCT Series in-line ultrasonic meter has been specifically designed for applications that require excellent accuracy & repeatability at an economical price point. The compact QCT Series has no moving parts and there is nothing in the flow stream that will cause an increase in pressure drop. This results in a very rugged, reliable and accurate flow meter. High accuracy & repeatability is achieved through the unique measurement section within the flow meter where the flow is conditioned and delta T is measured along the axis of the flow meter. The small footprint, lightweight device is ideal for low viscosity liquid applications including water based products, oils, and its all plastic construction makes it the meter of choice for many corrosive applications. With 50+ years of flow measurement experience, Flow Technology, Inc. maintains the highest standards of quality in its design, manufacturing and service. Its product line includes a wide range of turbine, positive displacement, electromagnetic, and clamp-on ultrasonic flow meters; flow calibrators; flow controllers; and ancillary electronics. Typical applications are found in the aerospace, automotive, industrial, metrology, oil & gas and sanitary fields. In addition, the company maintains one of the world’s largest primary standard flow meter calibration laboratories, and provides complete flow meter calibration, service and repair. Flow Technology, Inc. is registered to ISO 9001 & AS9100, accredited by NVLAP, and has calibration conformance to ISO/IEC 17025, MIL-STD-45662A and ANSI Z 540. Visit them at www.ftimeters.com.